Around half of the carbon that humans emit into the atmosphere each year is taken up on land (by trees) and in the ocean (by absorption). We construct a simple model of carbon uptake that, unlike the complex models that are usually used, can be analysed mathematically. Our results include that changes in atmospheric carbon may affect future carbon uptake more than changes in climate. Our simple model could also study mechanisms that are currently too uncertain for complex models. We present an open source software library for developing so-called World-Earth models that link physical, chemical and biological processes with social, economic and cultural processes to study the Earth system's future in the Anthropocene. Due to its modular structure, the software allows interdisciplinary studies of global change and sustainable development that combine stylized model components from Earth system science, climatology, economics, ecology, or sociology. Today, human interactions with the Earth system lead to complex feedbacks between social and ecological dynamics. Modeling such feedbacks explicitly in Earth system models (ESMs) requires making assumptions about individual decision making and behavior, social interaction, and their aggregation. In this overview paper, we compare different modeling approaches and techniques and highlight important consequences of modeling assumptions. We illustrate them with examples from land-use modeling. Extreme events such as floods and droughts result from synchronization of different natural processes working at multiple timescales. Investigation on an observation timescale will not reveal the inherent underlying dynamics triggering these events. This paper develops a new method based on wavelets and event synchronization to unravel the hidden dynamics responsible for such sudden events. This method is tested with synthetic and real-world cases and the results are promising. Human societies depend on the resources ecosystems provide. We study this coevolutionary relationship by utilizing a stylized model of resource users on a social network. This model demonstrates that social–cultural processes can have a profound influence on the environmental state, such as determining whether the resources collapse from overuse or not. This suggests that social–cultural processes should receive more attention in the modeling of sustainability transitions and the Earth system. Deforestation and subsequent land uses in the Brazilian Amazon have huge impacts on greenhouse gas emissions, local climate and biodiversity. To better understand these land-cover changes, we apply complex systems methods uncovering spatial patterns in regional transition probabilities between land-cover types, which we estimate using maps derived from satellite imagery. The results show clusters of similar land-cover dynamics and thus complement studies at the local scale. We assess the co-evolutionary dynamics of the Earth's carbon cycle and societal interventions through terrestrial carbon dioxide removal (tCDR) with a conceptual model in a planetary boundary context. The focus on one planetary boundary alone may lead to navigating the Earth system out of the safe operating space due to transgression of other boundaries. The success of tCDR depends on the degree of anticipation of climate change, the potential tCDR rate and the underlying emission pathway. In this study we systematically quantify simultaneities between meteorological extremes and the timing of flowering of four shrub species across Germany by using event coincidence analysis. Our study confirms previous findings of experimental studies, highlighting the impact of early spring temperatures on the flowering of the investigated plants. Additionally, the analysis reveals statistically significant indications of an influence of temperature extremes in the fall preceding the flowering. The debate about a safe and just operating space for humanity and the possible pathways towards and within it requires an analysis of the inherent dynamics of the Earth system and of the options for influencing its evolution. We present and illustrate with examples a conceptual framework for performing such an analysis not in a quantitative, optimizing mode, but in a qualitative way that emphasizes the main decision dilemmas that one may face in the sustainable management of the Earth system. Terrestrial water storage (TWS) plays a key role in global water and energy cycles. This work applies complex climate networks to analyzing spatial patterns in TWS. A comparative analysis is conducted using a remotely sensed (GRACE) and a model-generated TWS data set. Our results reveal hotspots of TWS anomalies around the global land surfaces. Prospects are offered on using network connectivity as constraints to further improve current global land surface models. Paleoclimate records from cave deposits allow the reconstruction of Holocene dynamics of the Asian monsoon system, an important tipping element in Earth's climate. Employing recently developed techniques of nonlinear time series analysis reveals several robust and continental-scale regime shifts in the complexity of monsoonal variability. These regime shifts might have played an important role as drivers of migration, cultural change, and societal collapse during the past 10,000 years. We use visibility graphs to characterize asymmetries in the dynamics of sunspot areas in both solar hemispheres. Our analysis provides deep insights into the potential and limitations of this method, revealing a complex interplay between effects due to statistical versus dynamical properties of the observed data. Temporal changes in the hemispheric predominance of the graph connectivity are found to lag those directly associated with the total hemispheric sunspot areas themselves. We present a new approach to estimating sedimentary proxy records along with the proxy uncertainty. We provide analytical expressions for the proxy record, while transparently propagating uncertainties from the ages to the proxy record. We represent proxies on an error-free, precise timescale. Our approach provides insight into the interrelations between proxy variability and the various uncertainties. We demonstrate our method with synthetic examples and proxy data from the Lonar lake in India. We investigate the modeling of the effects of the unresolved scales on the large scales of the coupled ocean–atmosphere model MAOOAM. 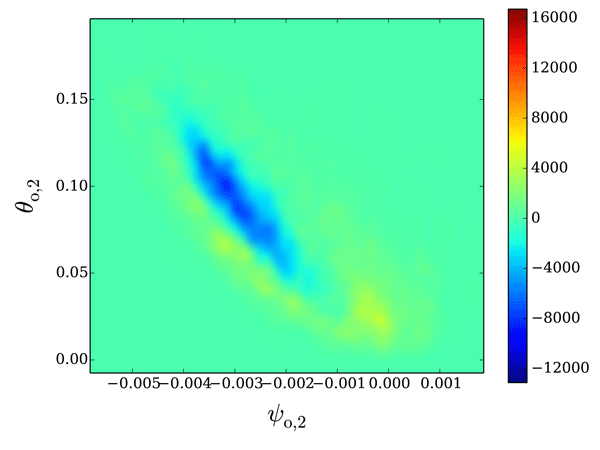 Two different physically based stochastic methods are considered and compared, in various configurations of the model. Both methods show remarkable performances and are able to model fundamental changes in the model dynamics. Ways to improve the parameterizations' implementation are also proposed. Bivariate probability density functions (pdfs) of wind speed characterize the relationship between speeds at two different locations or times. This study develops such pdfs of wind speed from distributions of the components, following a well-established approach for univariate distributions. The ability of these models to characterize example observed datasets is assessed. The mathematical complexity of these models suggests further extensions of this line of reasoning may not be practical. Hurricanes are complex systems that carry large amounts of energy. Its impact produces, most of the time, natural disasters involving the loss of human lives and of materials and infrastructure that is accounted for in billions of US dollars. Not everything is negative as hurricanes are the main source of rainwater for the regions where they develop. In this study we make a nonlinear analysis of the time series obtained from 1749 to 2012 of the hurricane occurrence in the Gulf of Mexico. We develop a general framework for the frequency analysis of irregularly sampled time series. We also design a test of significance against a general background noise which encompasses the Gaussian white or red noise. Our results generalize and unify methods developed in the fields of geosciences, engineering, astronomy and astrophysics. All the analysis tools presented in this paper are available to the reader in the Python package WAVEPAL. There is so far no general framework for handling the continuous wavelet transform when the time sampling is irregular. Here we provide such a framework with the Morlet wavelet, based on the results of part I of this study. We also design a test of significance against a general background noise which encompasses the Gaussian white or red noise. All the analysis tools presented in this article are available to the reader in the Python package WAVEPAL. We have applied tipping point analysis to a large record of ocean acoustic data to identify the main components of the acoustic dynamical system: long-term and seasonal trends, system states and fluctuations. We reconstructed a one-dimensional stochastic model equation to approximate the acoustic dynamical system. We have found a signature of El Niño events in the deep ocean acoustic data near the southwest Australian coast, which proves the investigative power of the tipping point methodology. We employ the Hilbert–Huang transform to study the temporal variability in time series of daily means of the surface solar irradiance (SSI) at different locations around the world. The data have a significant spectral peak corresponding to the yearly variability cycle and feature quasi-stochastic high-frequency "weather noise", irrespective of the geographical location or of the local climate. Our findings can improve models for estimating SSI from satellite images or forecasts of the SSI. Risk analysis of extremes has high socioeconomic relevance. Of crucial interest is the tail probability, P, of the distribution of a variable, which is the chance of observing a value equal to or greater than a certain threshold value, x. Many variables in geophysical systems (e.g. climate) show heavy tail behaviour, where P may be rather large. In particular, P decreases with x as a power law that is described by a parameter, α. We present an improved method to estimate α on data. Transport and mixing processes in fluid flows are crucially influenced by coherent structures, such as eddies, gyres, or jets in geophysical flows. We propose a very simple and computationally efficient approach for analyzing coherent behavior in fluid flows. The central object is a flow network constructed directly from particle trajectories. The network's local and spectral properties are shown to give a very good indication of coherent as well as mixing regions in the underlying flow. This work arose from a desire to understand the nature of particle motions in turbulence. We sought a simple conceptual model that could describe such motions, then realized that this model could be applicable to an array of other problems. The basic idea is to create a string of random numbers, called a stochastic process, that mimics the properties of particle trajectories. This model could be useful in making best use of data from freely drifting instruments tracking the ocean currents. Compound extreme events (e.g., simultaneous occurrence of hot and dry days) are likely to have a big impact on society. In our paper, we propose a new method to analyze the temporal succession of compound extreme events, an aspect that has been largely neglected so far. We analyze past and future changes and identify regions within Europe, which are probably susceptible to a future change in the succession of heavy precipitation and cold days in winter and hot and dry days in summer. This paper presents a new spectral approach to identifying the periodic patterns from the published Indian temperature variability records. The wavelet analysis of the SSA reconstructed time series highlights the removal of noise in the data and identifies the existence of a high-amplitude, recurrent, multidecadal scale patterns in the Indian continent, confirming the possible influences of sunspot-geomagnetic activity-ENSO through teleconnection. This paper is the first time that a complex network approach has been used for analysis of decadal climate predictions. We have developed an alternative estimator of heat periods based on network statistics, which turns out to be superior for parts of Europe. This paper opens the perspective that network measures have the potential to improve decadal predictions. In this article, bred vectors are computed from a single time series data using time-delay embedding, with a new technique, nearest-neighbor breeding. 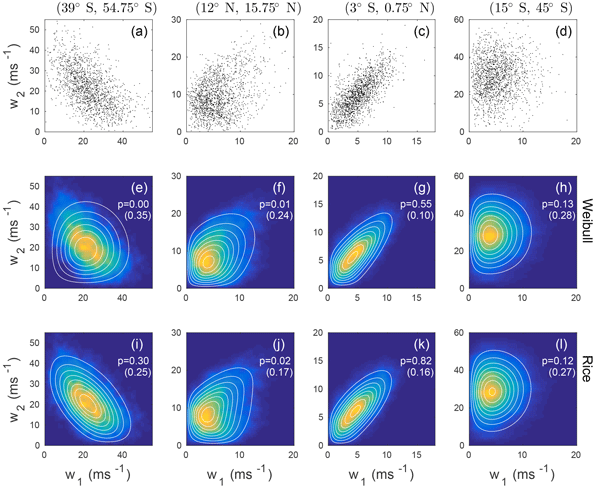 Since the dynamical properties of the nearest-neighbor bred vectors are shown to be similar to bred vectors computed using evolution equations, this provides a new and novel way to model and predict sudden transitions in systems represented by time series data alone. In the previous work (Yan et al., 2015, NPG), we proposed a novel method to detect the transition process of climate change and exposed a new understanding of climate change. In this work, by using this method, we studied several climate changes of the sea surface temperature over the past century. The result shows that the system is bi-stable, and the persist time of transition process is shortened. Besides, a quantitative relation among the transition process parameters is obtained and verified. The paper presents a new method called cumulative areawise testing that allows scientists to better extract important signals from geophysical time series. The method was found to be able to distinguish aspects of time series that are random from those of potential physical importance better than existing methods in wavelet analysis. This paper proposes a technique for dating an ice core. The proposed technique employs a hybrid method combining the sequential Monte Carlo method and the Markov chain Monte Carlo method, which is referred to as the particle Markov chain Monte Carlo method. The sequential Monte Carlo method, which is also known as the particle filter, is widely used for nonlinear time-series analysis. This paper demonstrates the usefulness of the approach in time-series analysis for dating an ice core. Statistical downscaling is widely used in large operational centers around the world, using exclusively linear relations (MLR); this study uses a statistical downscaling methodology using a nonlinear technique known as ANNs with CMIP5 project data. The artificial neural network can perform tasks that a linear program cannot. The main advantages of this are its temporal processing ability and its ability to incorporate several preceding predictor values as input without any additional effort. This paper presents a new technique of combining the driving force of a time series obtained using the slow feature analysis (SFA) approach, then introducing the driving force into a predictive model to predict nonstationary time series. It could be considered to be a data-driven attempt to make progress in predicting nonstationary climatic time series and in better understanding the climate causality research from observed climate data. The ability of empirical mode decomposition (EMD) to extract multi-decadal variability from sea level records is tested using three simulations, based on sinusoidal oscillations and climate indices. In all cases, the longest-period modes are significantly distorted, with incorrect amplitudes and phases. This affects the estimated acceleration computed from the longest periodic IMF. Additionally, in all cases, extra low-frequency modes uncorrelated with the prescribed variability are found. Non-Gaussian joint PDFs and Shannon negentropies allow for nonlinear correlations and synergetic interaction information among random variables. Third-order cross-cumulants (triadic correlations -- TCs) under pair-wise (total or partial) independence are maximized on projections and orthogonal rotations of the full PDF. Fourier analysis allows decomposing TCs as wave resonant triads working as non-Gaussian sources of dynamical predictability. An illustration is given in a minimal fluid model. We applied coupled heterogeneous association rule mining (CHARM), Lasso multivariate regression, and dynamic Bayesian networks to find relationships within a complex system, and explored means with which to obtain a consensus result from the application of such varied methodologies. Using this fusion of approaches, we identified relationships among climate factors that fall into two categories: well-known associations from prior knowledge, and putative links that invite further research. In the past few years, complex networks have been extensively applied to climate sciences, yielding the new field of climate networks. Here, we generalize climate network analysis by investigating the influence of altitudes in network topology. More precisely, we verified that nodes group into different communities corresponding to geographical areas with similar relief properties. This new approach may contribute to obtaining more complete climate network models. Abello, J. and Pogel, A.: Graph Partitions and Concept Lattices, Discrete Methods in Epidemiology, AMS-DIMACS Series, 70, 115–138, 2006. Abello, J., Hadlak, S., Schumann, H., and Schulz, H.-J. : A Modular Degree-of-Interest Specification for the Visual Analysis of Large Dynamic Networks, IEEE T. Visual. Comput. Graph., 20, 337–350, 2014. Adar, E.: GUESS: A Language and Interface for Graph Exploration, in: Proceedings of the SIGCHI Conference on Human Factors in Computing Systems (CHI), ACM, New York, NY, USA, 2006. Aigner, W., Miksch, S., Schumann, H., and Tominski, C.: Visualization of Time-Oriented Data, Springer, London, UK, 2011. Albert, R. and Barabasi, A. L.: Statistical Mechanics of Complex Networks, Rev. Modern Phys., 74, 47–97, 2002. Alper, B., Sümengen, S., and Balcisoy, S.: Dynamic visualization of geographic networks using surface deformations with constraints, in: Proc. of the Computer Graphics International Conference (CGI), Computer Graphics Society, Petrópolis, Brazil, 2007. Andrienko, G., Andrienko, N., Bak, P., Keim, D., and Wrobel, S.: Visual Analytics of Movement, Springer, Berlin, Heidelberg, 2013. Bach, B., Pietriga, E., and Fekete, J.-D.: GraphDiaries: Animated Transitions and Temporal Navigation for Dynamic Networks, T. Visual. Comput. Graph., 20, 740–754, 2013. Bastian, M., Heymann, S., and Jacomy, M.: Gephi: An Open Source Software for Exploring and Manipulating Networks, in: International AAAI Conference on Weblogs and Social Media, San Jose, California, USA, 2009. Berezin, Y., Gozolchiani, A., Guez, O., and Havlin, S.: Stability of climate networks with time, Scient. Rep., 2, 666, 2012. Bierkandt, R., Wenz, L., Willner, S. N., and Levermann, A.: Acclimate – a model for economic damage propagation, Part 1: basic formulation of damage transfer within a global supply network and damage conserving dynamics, Environ. Syst. Decis., 34, 507–524, 2014. Blaas, J., Botha, C., Peters, B., Vos, F., and Post, F.: Fast and reproducible fiber bundle selection in DTI visualization, in: IEEE Visualization'05, IEEE Computer Society, Minneapolis, MN, USA, 59–64, 2005. Boccaletti, S., Latora, V., Moreno, Y., Chavez, M., and Hwang, D. U.: Complex Networks: Structure and Dynamics, Phys. Rep., 424, 175–308, 2006. Boers, N., Bookhagen, B., Marwan, N., Kurths, J., and Marengo, J.: Complex networks identify spatial patterns of extreme rainfall events of the South American Monsoon System, Geophys. Res. Lett., 40, 4386–4392, 2013. Boers, N., Bookhagen, B., Barbosa, H. M. J., Marwan, N., Kurths, J., and Marengo, J. A.: Prediction of extreme floods in the eastern Central Andes based on a complex networks approach, Nat. Commun., 5, 5199, 2014. Böttger, J., Schafer, A., Lohmann, G., Villringer, A., and Margulies, D. S.: Three-Dimensional Mean-Shift Edge Bundling for the Visualization of Functional Connectivity in the Brain, IEEE T. Visual. Comput. Graph., 20, 471–480, 2014. Brambilla, A., Carnecky, R., Peikert, R., Viola, I., and Hauser, H.: Illustrative Flow Visualization: State of the Art, Trends and Challenges, in: EuroGraphics 2012 State of the Art Reports (STARs), 75–94, https://doi.org/10.2312/conf/EG2012/stars/075-094, 2012. Brodkorb, F., Kuijper, A., Andrienko, G., Andrienko, N., and von Landesberger, T.: Overview with Details for Exploring Geo-located Graphs on Maps, Information Visualization, IEEE Computer Society, Chicago, IL, USA, https://doi.org/10.1177/1473871615597077, 2015. Buschmann, S., Trapp, M., and Döllner, J.: Real-Time Animated Visualization of Massive Air-Traffic Trajectories, in: Proceedings of CyberWorlds 2014, IEEE Computer Society, Santander, Spain, 172–181, 2014a. Buschmann, S., Trapp, M., Lühne, P., and Döllner, J.: Hardware-accelerated attribute mapping for interactive visualization of complex 3D trajectories, in: Proc. of International Conference on Information Visualization Theory and Applications, Lisbon, Portugal, 355–363, 2014b. Cui, W., Zhou, H., Qu, H., Wong, P. C., and Li, X.: Geometry-based edge clustering for graph visualization, IEEE T. Visual. Comput. Graph., 14, 1277–1284, 2008. Davidsen, J., Grassberger, P., and Paczuski, M.: Networks of recurrent events, a theory of records, and an application to finding causal signatures in seismicity, Phys. Rev. E, 77, 066104, https://doi.org/10.1103/PhysRevE.77.066104, 2008.
de Nooy, W., Mrvar, A., and Batagelj, V.: Exploratory Social Network Analysis with Pajek, Cambridge University Press, 2005. Díaz, J., Petit, J., and Serna, M.: A Survey of Graph Layout Problems, ACM Comput. Surv., 34, 313–356, 2002. Donges, J. F., Zou, Y., Marwan, N., and Kurths, J.: The Backbone of the Climate Network, Europhys. Lett., 87, 48007, 2009a. Donges, J. F., Zou, Y., Marwan, N., and Kurths, J.: Complex Networks in Climate Dynamics, Eur. Phys. J., 174, 157–179, 2009b. Donges, J. F., Schultz, H. C. H., Marwan, N., Zou, Y., and Kurths, J.: Investigating the topology of interacting networks: theory and application to coupled climate subnetworks, Eur. Phys. J. B, 84, 635–651, 2011. Donges, J. F., Heitzig, J., Beronov, B., Wiedermann, M., Runge, J., Feng, Q.-Y., Tupikina, L., Stolbova, V., Donner, R. V., Marwan, N., Dijkstra, H. A., and Kurths, J.: Unified functional network and nonlinear time series analysis for complex systems science: The pyunicorn package, Preprint: arxiv.org:1507.01571 [physics.data-an], 2015a. Donges, J. F., Petrova, I., Loew, A., Marwan, N., and Kurths, J.: How complex climate networks complement eigen techniques for the statistical analysis of climatological data, Clim. Dynam., https://doi.org/10.1007/s00382-015-2479-3, in press, 2015b. Donner, R. V., Zou, Y., Donges, J. F., Marwan, N., and Kurths, J.: Recurrence networks – A novel paradigm for nonlinear time series analysis, New J. Phys., 12, 033205, https://doi.org/10.1088/1367-2630/12/3/033025, 2010. Ebert-Uphoff, I. and Deng, Y.: Causal Discovery Methods for Climate Networks, Tech. Rep. GT-ME-2010-001, Georgia Institute of Technology, Atlanta, Georgia, USA, 2010. Ellis, G. and Dix, A.: A Taxonomy of Clutter Reduction for Information Visualisation, IEEE T. Visual. Comput. Graph., 13, 1216–1223, 2007. Elmqvist, N. and Tsigas, P.: A Taxonomy of 3D Occlusion Management for Visualization, IEEE T. Visual. Comput. Graph., 14, 1095–1109, 2008. Ersoy, O., Hurter, C., Paulovich, F. V., Cantareiro, G., and Telea, A.: Skeleton-based edge bundling for graph visualization, IEEE T. Visual. Comput. Graph., 17, 2364–2373, 2011. Feldhoff, J. H., Lange, S., Volkholz, J., Donges, J. F., Kurths, J., and Gerstengarbe, F.-W.: Complex networks for climate model evaluation with application to statistical versus dynamical modeling of South American climate, Clim. Dynam., 44, 1567–1581, https://doi.org/10.1007/s00382-014-2182-9, 2015. Feng, A., Gong, Z., Wang, Q., and Feng, G.: Three-dimensional air–sea interactions investigated with bilayer networks, Theor. Appl. Climatol., 109, 635–643, 2012. Feng, Q. Y. and Dijkstra, H.: Are North Atlantic multidecadal SST anomalies westward propagating?, Geophys. Res. Lett., 41, 541–546, 2014. Fruchterman, T. M. J. and Reingold, E. M.: Graph drawing by force-directed placement, Softw. Pract. Exp., 21, 1129–1164, 1991. Fuchs, R. and Hauser, H.: Visualization of Multi-variate Scientific Data, The Eurographics Association and Blackwell Publishing Ltd, Comput. Graph. Forum, 28, 1670–1690, https://doi.org/10.1111/j.1467-8659.2009.01429.x, 2009. Furnas, G. W.: Generalized Fisheye Views, SIGCHI Bull., 17, 16–23, 1986. Ganguly, A. R., Kodra, E. A., Agrawal, A., Banerjee, A., Boriah, S., Chatterjee, Sn., Chatterjee, So., Choudhary, A., Das, D., Faghmous, J., Ganguli, P., Ghosh, S., Hayhoe, K., Hays, C., Hendrix, W., Fu, Q., Kawale, J., Kumar, D., Kumar, V., Liao, W., Liess, S., Mawalagedara, R., Mithal, V., Oglesby, R., Salvi, K., Snyder, P. K., Steinhaeuser, K., Wang, D., and Wuebbles, D.: Toward enhanced understanding and projections of climate extremes using physics-guided data mining techniques, Nonlin. Processes Geophys., 21, 777–795, https://doi.org/10.5194/npg-21-777-2014, 2014. Gansner, E. R., Koren, Y., and North, S.: Topological fisheye views for visualizing large graphs, IEEE T. Visual. Comput. Graph., 11, 457–468, 2005. Gansner, E. R., Hu, Y., North, S., and Scheidegger, C.: Multilevel agglomerative edge bundling for visualizing large graphs, in: IEEE 2011 Pacific Visualization Symposium (PacificVis), Hong Kong, 187–194, 2011. Gladisch, S., Schumann, H., and Tominski, C.: Navigation Recommendations for Exploring Hierarchical Graphs, in: Advances in Visual Computing, vol. 8034 of Lecture Notes in Computer Science, edited by: Bebis, G., Boyle, R., Parvin, B., Koracin, D., Li, B., Porikli, F., Zordan, V., Klosowski, J., Coquillart, S., Luo, X., Chen, M., and Gotz, D., Springer, Berlin, Heidelberg, 36–47, 2013. Guez, O., Gozolchiani, A., Berezin, Y., Brenner, S., and Havlin, S.: Climate network structure evolves with North Atlantic Oscillation phases, Europhys. Lett., 98, 38006, 2012. Guez, O., Gozolchiani, A., Berezin, Y., Wang, Y., and Havlin, S.: Global climate network evolves with North Atlantic Oscillation phases: Coupling to Southern Pacific Ocean, Europhys. Lett., 103, 68006, 2013. Hadlak, S., Schulz, H.-J., and Schumann, H.: In Situ Exploration of Large Dynamic Networks, IEEE T. Visual. Comput. Graph., 17, 2334–2343, 2011. Hadlak, S., Schumann, H., and Schulz, H.-J. : A Survey of Multi-faceted Graph Visualization, State-of-the-Art Report at EuroVis'15, Cagliari, Sardinia, Italy, 1–20, 2015. Heitzig, J., Donges, J. F., Zou, Y., Marwan, N., and Kurths, J.: Node-weighted measures for complex networks with spatially embedded, sampled, or differently sized nodes, Eur. Phys. J. B, 85, 38, 2012. Hlinka, J., Hartman, D., Jajcay, N., Vejmelka, M., Donner, R., Marwan, N., Kurths, J., and Paluš, M.: Regional and inter-regional effects in evolving climate networks, Nonlin. Processes Geophys., 21, 451–462, https://doi.org/10.5194/npg-21-451-2014, 2014. Holme, P. and Saramäki, J.: Temporal networks, Phys. Rep., 519, 97–125, 2012. Holten, D.: Hierarchical edge bundles: Visualization of adjacency relations in hierarchical data, IEEE T. Visual. Comput. Graph., 12, 741–748, 2006. Holten, D. and van Wijk, J. J.: Force-Directed Edge Bundling for Graph Visualization, Comput. Graph. Forum, 28, 983–990, 2009. Hu, P. and Lau, W. C.: A Survey and Taxonomy of Graph Sampling, CoRR, abs/1308.5865, arXiv:1308.5865 [cs.SI], 2013. Hu, Y. and Shi, L.: Visualizing large graphs, Wiley Interdis. Rev. : Comput. Stat., 7, 115–136, 2015. Hurter, C., Telea, A., and Ersoy, O.: Moleview: An attribute and structure-based semantic lens for large element-based plots, IEEE. T. Visual. Comput. Graph., 17, 2600–2609, 2011. 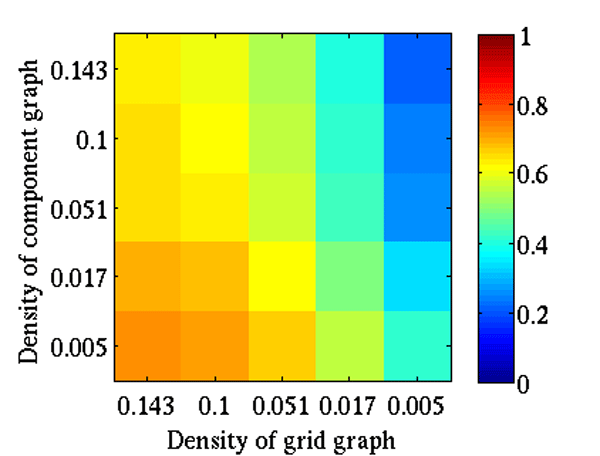 Hurter, C., Ersoy, O., and Telea, A.: Graph bundling by kernel density estimation, Comput. Graph. Forum, 31, 865–874, 2012. Hurter, C., Ersoy, O., Fabrikant, S., Klein, T., and Telea, A.: Bundled Visualization of DynamicGraph and Trail Data, IEEE. T. Visual. Comput. Graph., 20, 1141–1157, 2014. Iwayama, K., Hirata, Y., Takahashi, K., Watanabe, K., Aihara, K., and Suzuki, H.: Characterizing global evolutions of complex systems via intermediate network representations, Scient. Rep., https://doi.org/10.1038/srep00423, in press, 2012. Jacomy, M., Venturini, T., Heymann, S., and Bastian, M.: ForceAtlas2, a Continuous Graph Layout Algorithm for Handy Network Visualization Designed for the Gephi Software, PLoS ONE, 9, e98679, https://doi.org/10.1371/journal.pone.0098679, 2014. Keim, D., Andrienko, G., Fekete, J.-D., Görg, C., Kohlhammer, J., and Melancon, G.: Visual Analytics: Definition, Process, and Challenges, in: Information Visualization, vol. 4950 of Lecture Notes in Computer Science, edited by: Kerren, A., Stasko, J., Fekete, J.-D., and North, C., Springer, Berlin, Heidelberg, 154–175, 2008. Keim, D. A., Kohlhammer, J., Ellis, G., and Mansmann, F. (Eds. ): Mastering the Information Age – Solving Problems with Visual Analytics, Eurographics, Eurographics Association, Goslar, Germany, 2010. Kistler, R., Kalnay, E., Collins, W., Saha, S., White, G., Woollen, J., Chelliah, M., Ebisuzaki, W., Kanamitsu, M., Kousky, V., Dool, H. V. D., Jenne, R., and Fiorino, M.: The NCEP–NCAR 50-Year Reanalysis: Monthly Means CD–ROM and Documentation, B. Am. Meteorol. Soc., 82, 247–268, 2001. Krüger, R., Thom, D., Wörner, M., Bosch, H., and Ertl, T.: TrajectoryLenses – A Set-based Filtering and Exploration Technique for Long-term Trajectory Data, Comput. Graph. Forum, 32, 451–460, 2013. Lambert, A., Bourqui, R., and Auber, D.: Winding roads: Routing edges into bundles, Comput. Graph. Forum, 29, 853–862, 2010. Lange, S., Donges, J. F., Volkholz, J., and Kurths, J.: Local difference measures between complex networks for dynamical system model evaluation, PLoS ONE, 10, e0118088, https://doi.org/10.1371/journal.pone.0118088, 2015. Lehnertz, K., Ansmann, G., Bialonski, S., Dickten, H., Geier, C., and Porz, S.: Evolving networks in the human epileptic brain, Physica D, 267, 7–15, 2014. 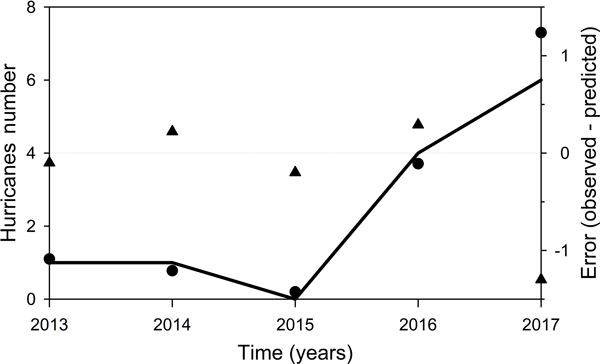 Ludescher, J., Gozolchiani, A., Bogachev, M. I., Bunde, A., Havlin, S., and Schellnhuber, H. J.: Improved El Niño forecasting by cooperativity detection, P. Natl. Acad. Sci. USA, 110, 11742–11745, 2013. Ludescher, J., Gozolchiani, A., Bogachev, M. I., Bunde, A., Havlin, S., and Schellnhuber, H. J.: Very early warning of next El Niño, P. Natl. Acad. Sci. USA, 111, 2064–2066, 2014. Malik, N., Marwan, N., and Kurths, J.: Spatial structures and directionalities in Monsoonal precipitation over South Asia, Nonlin. Processes Geophys., 17, 371–381, https://doi.org/10.5194/npg-17-371-2010, 2010. Malik, N., Bookhagen, B., Marwan, N., and Kurths, J.: Analysis of spatial and temporal extreme monsoonal rainfall over South Asia using complex networks, Clim. Dynam., 39, 971–987, 2012. Meehl, G. A., Covey, C., Delworth, T., Latif, M., McAvaney, B., Mitchell, J. F. B., Stouffer, R. J., and Taylor, K. E.: The WCRP CMIP3 Multimodel Dataset: A New Era in Climate Change Research, B. Am. Meteorol. Soc., 88, 1383, https://doi.org/10.1175/BAMS-88-9-1383, 2007. Menck, P. J., Heitzig, J., Kurths, J., and Schellnhuber, H. J.: How dead ends undermine power grid stability, Nat. Commun., 5, 3969, https://doi.org/10.1038/ncomms4969, 2014. Molkenthin, N., Rehfeld, K., Marwan, N., and Kurths, J.: Networks from flows – from dynamics to topology, Scient. Rep., 4, 4119, https://doi.org/10.1038/srep04119, 2014. Newman, M. E. J.: The Structure and Function of Complex Networks, SIAM Rev., 45, 167–256, 2003. Nicholson, S.: The nature of rainfall variability over Africa on time scales of decades to millenia, Global Planet. Change, 26, 137–158, 2000. Nocaj, A., Ortmann, M., and Brandes, U.: Untangling Hairballs, in: Graph Drawing, vol. 8871 of Lecture Notes in Computer Science, edited by: Duncan, C. and Symvonis, A., Springer, Berlin, Heidelberg, 101–112, 2014. Petrova, I.: Structural interrelationships between evaporation and precipitation: Application of complex networks to satellite based fields, Master's thesis, University of Hamburg, 2012. Phan, D., Xiao, L., Yeh, R., Hanrahan, P., and Winograd, T.: Flow Map Layout, in: Proc. of IEEE Symposium on Information Visualization, edited by: Stasko, J. and Ward, M. O., IEEE Computer Society, Minneapolis, Minnesota, USA, 219–224, 2005. Phillips, J. D., Schwanghart, W., and Heckmann, T.: Graph theory in the geosciences, Earth-Sci. Rev., 143, 147–160, 2015. Radebach, A., Donner, R. V., Runge, J., Donges, J. F., and Kurths, J.: Disentangling different types of El Niño episodes by evolving climate network analysis, Phys. Rev. E, 88, 052807, https://doi.org/10.1103/PhysRevE.88.052807, 2013. Rehfeld, K., Marwan, N., Breitenbach, S. F. M., and Kurths, J.: Late Holocene Asian summer monsoon dynamics from small but complex networks of paleoclimate data, Clim. Dynam., 41, 3–19, 2012. Rheinwalt, A., Marwan, N., Kurths, J., Werner, P., and Gerstengarbe, F.-W.: Boundary effects in network measures of spatially embedded networks, Europhys. Lett., 100, 28002, https://doi.org/10.1209/0295-5075/100/28002, 2012. Rodgers, P.: Graph Drawing Techniques for Geographic Visualization, in: Exploring Geovisualization, edited by: Dykes, J., MacEachren, A. M., and Kraak, M.-J., Elsevier, Amsterdam, 143–158,2005. Rozenblat, C. and Melançon, G. (Eds. ): Methods for Multilevel Analysis and Visualisation of Geographical Networks, in: vol. 11 of Methodos Series, Springer, Dordrecht, 2013. Runge, J., Heitzig, J., Petoukhov, V., and Kurths, J.: Escaping the Curse of Dimensionality in Estimating Multivariate Transfer Entropy, Phys. Rev., Lett., 108, 258701, https://doi.org/10.1103/PhysRevLett.108.258701, 2012. Schulz, H.-J., Hadlak, S., and Schumann, H.: Point-Based Visualization for Large Hierarchies, IEEE T. Visual. Comput. Graph., 17, 598–611, 2011. Solomon, S., Qin, D., Manning, M., Chen, Z., Marquis, M., Averyt, K., Tignor, M., and Miller, H. (Eds. ): IPCC, 2007: Climate Change 2007: The Physical Science Basis, in: Contribution of Working Group I to the Fourth Assessment Report of the Intergovernmental Panel on Climate Change, Cambridge University Press, Cambridge, UK and New York, NY, USA, 2007. Steinhaeuser, K. and Tsonis, A. A.: A climate model intercomparison at the dynamics level, Clim. Dynam., 42, 1665–1670, 2013. Steinhaeuser, K., Chawla, N. V., and Ganguly, A. R.: Complex networks as a unified framework for descriptive analysis and predictive modeling in climate science, Statistical Analysis and Data Mining, ASA Data Sci. J., 4, 497–511, 2011. Stolbova, V., Martin, P., Bookhagen, B., Marwan, N., and Kurths, J.: Topology and seasonal evolution of the network of extreme precipitation over the Indian subcontinent and Sri Lanka, Nonlin. Processes Geophys., 21, 901–917, https://doi.org/10.5194/npg-21-901-2014, 2014. Tantet, A. and Dijkstra, H. A.: An interaction network perspective on the relation between patterns of sea surface temperature variability and global mean surface temperature, Earth Syst. Dynam., 5, 1–14, https://doi.org/10.5194/esd-5-1-2014, 2014. Telea, A. and Ersoy, O.: Image-Based Edge Bundles: Simplified Visualization of Large Graphs, Comput. Graph. Forum, 29, 843–852, 2010. Thomas, J. J. and Cook, K. A.: Illuminating the path: The research and development agenda for visual analytics, IEEE Computer Society Press, National Visualization and Analytics Center, 2005. Tominski, C., Abello, J., and Schumann, H.: CGV – An Interactive Graph Visualization System, Comput. Graph., 33, 660–678, 2009. Tominski, C., Donges, J. F., and Nocke, T.: Information Visualization in Climate Research, in: Proceedings of the International Conference Information Visualisation (IV), IEEE Computer Society, London, 298–305, 2011. Tominski, C., Gladisch, S., Kister, U., Dachselt, R., and Schumann, H.: A Survey on Interactive Lenses in Visualization, in: EuroVis State-of-the-Art Reports, Eurographics Association, Swansea, UK, 43–62, 2014. Tsonis, A. and Swanson, K.: Topology and Predictability of El Niño and La Niña Networks, Phys. Rev. Lett., 100, 228502, https://doi.org/10.1103/PhysRevLett.100.228502, 2008. Tsonis, A. A. and Roebber, P. J.: The Architecture of the Climate Network, Physica A, 333, 497–504, 2004. Tsonis, A. A., Swanson, K., and Kravtsov, S.: A new dynamical mechanism for major climate shifts, Geophys. Res. Lett., 34, l13705, https://doi.org/10.1029/2007GL030288, 2007. Tsonis, A. A., Swanson, K. L., and Wang, G.: On the Role of Atmospheric Teleconnections in Climate, J. Climate, 21, 2990–3001, 2008. Tupikina, L., Rehfeld, K., Molkenthin, N., Stolbova, V., Marwan, N., and Kurths, J.: Characterizing the evolution of climate networks, Nonlin. Processes Geophys., 21, 705–711, https://doi.org/10.5194/npg-21-705-2014, 2014.
van der Mheen, M., Dijkstra, H. A., Gozolchiani, A., den Toom, M., Feng, Q., Kurths, J., and Hernandez-Garcia, E.: Interaction network based early warning indicators for the Atlantic MOC collapse, Geophys. Res. Lett., 40, 2714–2719, 2013.
van Ham, F. and Perer, A.: "Search, Show Context, Expand on Demand": Supporting Large Graph Exploration with Degree-of-Interest, IEEE T. Visual. Comput. Graph., 15, 953–960, 2009.
van Ham, F. and Wattenberg, M.: Centrality Based Visualization of Small World Graphs, Comput. Graph. Forum, 27, 975–982, 2008.
von Landesberger, T., Kuijper, A., Schreck, T., Kohlhammer, J., van Wijk, J., Fekete, J.-D., and Fellner, D.: Visual Analysis of Large Graphs: State-of-the-Art and Future Research Challenges, Comput. Graph. Forum, 30, 1719–1749, 2011.
von Storch, H. and Zwiers, F. W.: Statistical Analysis in Climate Research, Cambridge University Press, 1999. Wallace, J. and Gutzler, D.: Teleconnections in the Geopotential Height Field During the Northern Hemisphere Winter, Mon. Weather Rev., 109, 784–812, 1981. Wang, Y., Gozolchiani, A., Ashkenazy, Y., Berezin, Y., Guez, O., and Havlin, S.: Dominant Imprint of Rossby Waves in the Climate Network, Phys. Rev. Lett., 111, 138501, https://doi.org/10.1103/PhysRevLett.111.138501, 2013. Wiedermann, M., Donges, J. F., Heitzig, J., and Kurths, J.: Node-weighted interacting network measures improve the representation of real-world complex systems, Europhys. Lett., 102, 28007, https://doi.org/10.1209/0295-5075/102/28007, 2013. Wiedermann, M., Donges, J. F., Handorf, D., Kurths, J., and Donner, R. V.: Hierarchical structures in Northern Hemispheric extratropical winter ocean–atmosphere interactions, arXiv preprint arXiv:1506.06634, 2015. Withall, M., Phillips, I., and Parish, D.: Network visualisation: a review, IET Commun., 1, 365–372, 2007. Wolff, A.: Graph Drawing and Cartography, in: Handbook of Graph Drawing and Visualization, edited by: Tamassia, R., CRC Press, Boca Raton, FL, USA, 697–736, 2013. Wong, P. C., Shen, H.-W., Leung, R., Hagos, S., Lee, T.-Y., Tong, X., and Lu, K.: Visual analytics of large-scale climate model data, in: IEEE 4th Symposium on Large Data Analysis and Visualization (LDAV) 2014, Paris, France, 85–92, 2014. Yamasaki, K., Gozolchiani, A., and Havlin, S.: Climate Networks Around the Globe are Significantly Affected by El Niño, Phys. Rev. Lett., 100, 228501, https://doi.org/10.1103/PhysRevLett.100.228501, 2008. Zemp, D. C., Schleussner, C.-F., Barbosa, H. M. J., van der Ent, R. J., Donges, J. F., Heinke, J., Sampaio, G., and Rammig, A.: On the importance of cascading moisture recycling in South America, Atmos. Chem. Phys., 14, 13337–13359, https://doi.org/10.5194/acp-14-13337-2014, 2014a. Zemp, D., Wiedermann, M., Kurths, J., Rammig, A., and Donges, J. F.: Node-weighted measures for complex networks with directed and weighted edges for studying continental moisture recycling, Europhys. Lett., 107, 58005, https://doi.org/10.1209/0295-5075/107/58005, 2014b. Zhang, Q., Eagleson, R., and Peters, T. M.: Volume Visualization: A Technical Overview with a Focus on Medical Applications, J. Digit. Imag., 24, 640–664, 2011. Zhu, X. and Guo, D.: Mapping Large Spatial Flow Data with Hierarchical Clustering, Trans. GIS, 18, 421–435, 2014. Zou, Y., Donges, J. F., and Kurths, J.: Recent Advances in Complex Climate Network Analysis, Complex Syst. Complex. Sci., 8, 27–38, 2011.